A passionate coalition of over 11,000 citizens and 280 businesses are pushing hard for their state, Colorado, to become a true rooftop solar power leader. They are pushing for 1 million solar rooftops, or 3,000 megawatts of solar power capacity, in the state by 2030. Currently, the state’s solar power capacity is equal to 300 megawatts. According to some estimates, the Colorado solar industry has already brought $1.42 billion and 10,000 full-time jobs to the Colorado. With a ten-fold increase, that could mean $10.42 billion and 100,000 jobs. 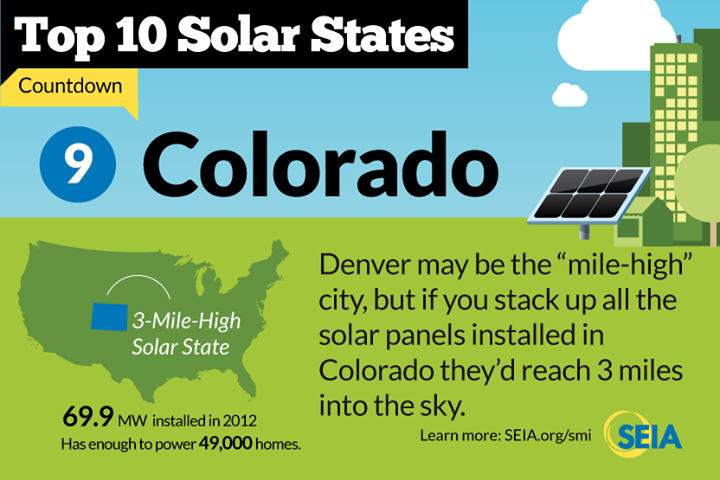 We’re a solar-focused website, so we’re obviously quite supportive of the idea that Colorado could and should aim for this 1 million solar rooftop target. But we’re not thoughtlessly for solar power — we promote going solar because it makes sense to do so! Below are 5 key reasons why the state should get behind this strong citizen and small business push. Let’s start with the obvious. Of course, the numbers extrapolated above don’t come out of a thorough study, but it’s clear that a ten-fold increase in solar power development in the state would considerably boost the state’s economy and provide jobs for many more Coloradans. Whatever the billion-dollar total and jobs total would be, homegrown electricity would be a huge win for Colorado. Coal power costs the US about $500 billion a year in health costs alone, according to a study conducted by the former director of the Harvard Medical School. Colorado residents pay their fair share of that at the hospital and through premature death caused by coal pollution. The human suffering is actually incalculable. Asthma, cancer, loss of life, and so on — who wants that? Colorado can quickly move away from this electricity source of the past, and also avoid many of the health and water problems associated with natural gas through strong development of solar power and wind power. This would be a clear win for the beautiful state and its residents. I don’t think people who decide to do nothing to fight global warming actually “get off the hook” for it. Not acting to fight global warming surely wares on their conscience. It’s hard to quantify, but it certainly has an effect on people’s contentment. Avoiding problems is not a good thing, and we know that. With a 3,000-megawatt-by-2030 push, Colorado residents could certainly feel better about themselves in this regard. Overall, a very decentralized network of power provides actually creates a more secure and reliable grid. It also means that the financial benefits of producing electricity are democratized, spread amongst the populous to a much greater degree, rather than hogged by energy monopolies. A more empowered citizenry and a stronger middle class benefits the state’s economy and culture. It improves morale and residential satisfaction. And, to put it bluntly, it’s simply much more equitable or fair. Putting power production in the hands of citizens is also proven to make them more energy conscious and energy efficient. There’s no point in wasting energy and money, and there are large economic and environmental benefits to be had from a more energy conscious and energy efficient populous. Colorado is often seen as a beautiful place to visit and a wonderful place to live. It’s also a leader in a number of respects. Becoming a, if not the, leading solar power state would certainly add to those credentials. It would put Colorado in an even more positive light. It would benefit the the US; it would benefit the world; and it would offer many strong benefits to the people of Colorado. Indeed, it would benefit the citizens of Colorado more than anyone else. A 2030 target of 3,000 MW of solar power capacity, the majority of it being on the roofs of homes and businesses, should be pursued. And Colorado isn’t the only state that should be pursuing it!